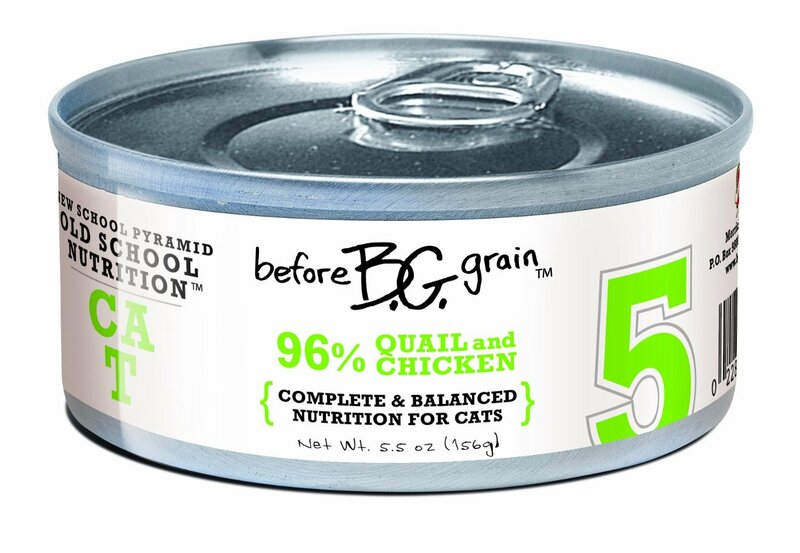 Q & A: How Do I Transition My Cat to a Canned Food Diet? Some kitties take to switching to canned very easily, while others are definitely die-hard kibble munchers! For starters, you should get the kibble completely out of the house; if the cat can even smell it in the cupboard, they will know it is there and hold out for it. One of Mad About Pets' cats' favorites! For my cats, I discovered that each of them was picky about flavor and texture. One of the cats would only eat pate, while another preferred shreds. I went to the pet store and bought a huge variety of different flavors and formulas to see which ones would be the most popular. Granted I ended up with a lot of wasted cat food, but at least I figured out which flavors worked out best! My cats ended up deciding on Holistic Select Chicken & Lamb, Holistic Select Duck & Chicken, Merrick Before Grain Quail, NutriSource Chicken & Rice , Nutro Max Cat Turkey & Giblets and Nutro Max Cat Chicken & Liver. Some of those are better than others, like the Merrick food doesn't have any grain or vegetables. I try to give them a mix, though, so they don't get bored of one flavor. The less grain or vegetables the better when it comes to moist food. In the "wild", cats wouldn't eat grains or vegetables beyond what is contained in the entrails of their prey. Grain and vegetables look nice in the ingredients list, but they're just filler. One thing I look for when buying canned foods is I don't want anything that had seafood as an ingredient. You have to check the labels because many of the foods will have seafood flavoring hidden in the ingredients to make it tastier to kitties. However, many cats develop allergies and sensitivities to seafood, or will refuse to eat anything else if they are offered seafood. Since my kitty Gabe has IBD, it was especially important for him to stay away from seafood. Most "normal" cats can have seafood a few times a week, but I prefer to just keep it out of my house altogether and try to focus on foods that would be more typical of a cat's prey like foul. For kitties that are stubborn about moist food, there are a few tips you can try to make the food more tempting to them. You can try mixing some warm water into the food; this brings the scent out and sort of creates a "gravy" they can lap up. You can try sprinkling some Parmesan cheese on top of the food, or even crushing up some of the cat's old kibble and sprinkling it on top. If your cat likes tuna, you can try pouring some tuna water on top. 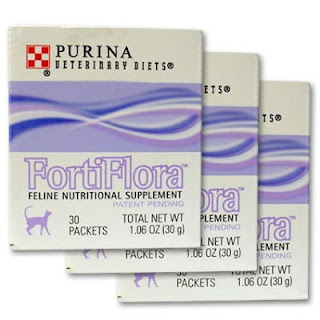 Otherwise some kitties really like the flavor of the probiotic FortiFlora, and will eat just about anything you sprinkle it on (my Birman is nuts for this stuff.) Adding the probiotic would not be a bad idea anyway; it can help the tummy handle switching over to a new type of food and avoid diarrhea. The main thing you have to watch out for with kitties when switching to a new food is Fatty Liver Disease (Hepatic Lipadosis). If a cat refuses to eat, his liver is forced to use fat from the body for energy (which it is not very good at converting). The liver can't handle this, and essentially becomes loaded with fat. This is almost always fatal in cats without proper treatment. Cats can go about 2-3 days without eating, but after that the risk of Fatty Liver is great. 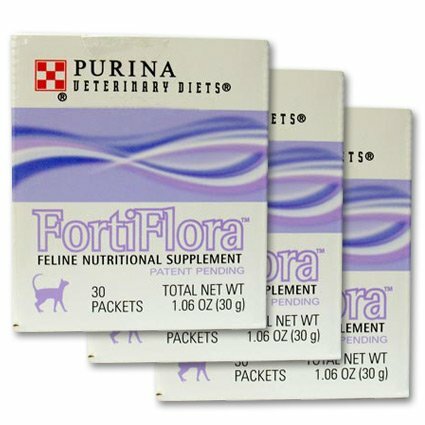 As long as your kitty is eating a little, though, the body won't have to resort to using those fat stores exclusively. The best thing you can do is break the feedings up into 2-3 meals per day (preferably 3). If you give the cat a whole can of food at once, they're probably not going to be able to eat it all at once. In the "wild", a cat would eat several times a day so doing multiple feedings will mimic that. Hunger can be a great asset in convincing your kitty to switch to moist food, so if the cat doesn't eat for a day it's going to be ok. They may try a hunger strike with you and hold out for kibble, but after a day they'll be hungry enough to eat the moist whether they want it or not! Whatever you do, just be certain your cat is getting at least a little food in her system during this transitional period and always has access to plenty of fresh water. If you're used to offering your cat a free freeding kibble buffet, you may be unsure how much moist food your cat needs on a canned only diet. The rule of thumb is this: 5-6 oz per each 7 pounds your cat weighs. 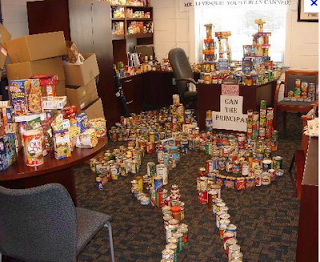 Most canned food comes in 5.5 oz cans, so a 7 pound cat will eat one can per day. Weight and activity level are both factors in determining how much your cat should eat. If she's an overweight couch potato, stick with one can per day. If she's a lean and active kitty, you'll need to feed a little more. You'll want to feed at each feeding no more than your cat can eat in 30 minutes; a little trial and error and you'll figure out your kitty's necessary feeding amounts. Choosing the right dog food for your dog can be a challenge with all of the different options available. Whereas most cat breeds are generally about the same size and vary only moderately in activity level, dogs run the gamut from teeny tiny pocket puppies to huge Irish Wolfhounds. Since there is no “one size fits all” for dogs, how does one go about choosing the right food option? The first thing to consider is the size of the kibble or chunks. 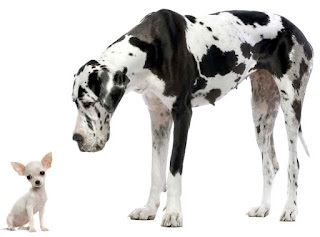 A big dog will have no trouble gulping down kibble or meat chunks, but a smaller toy dog needs a food that reflects his small stature. Many top manufacturers are now offering food that is easier to chew, swallow and digest for small dogs. For very small breeds like Chihuahuas or Miniature Pinschers, a general “adult dog” kibble is going to be far too large for them to eat comfortably. For these small dogs, specialty dog foods for especially for small dogs are the best dog food, and of course come in many delicious flavors to tempt even the pickiest pooches. This formula can be used as a basic guideline for your dog’s caloric requirements. However, energy levels should also be taken into account. A dog who runs 5 miles a day will need more calories than a dog who never leaves the couch! Always monitor your pet’s weight carefully and adjust the amount of food being offered to reflect any weight changes or gains. Nutrition for dogs, just as it is for human, is a complicated subject; talk to your vet for help with determining the best diet for your dog’s needs. Thank you so much for hosting me on your site. I love its name, Mad About Pets – it’s perfect! You asked me to talk about Charlie, my Golden Retriever who is the subject of my dog memoir Charlie: A Love Story, about the impact he had on my family, and about what living with any dog means to a family. Great topics – and fun to think about! I love all dogs and have all my life. I’ve had a number of them, at one point four dogs and two cats, which was paradise! 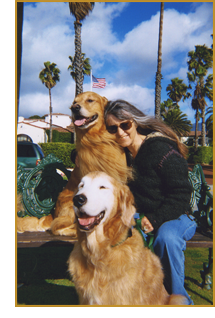 Mostly I’ve had Golden Retrievers, whom I just adore. For me they’re the perfect family dog: smart, very playful, and endowed with an abundant emotional intelligence that makes them very sensitive to people’s needs and wants. They love people, adults and children, and other dogs, so they fit easily into a family. But because of these wonderful qualities, don’t look to the Golden Retriever to be a great watchdog! If you want protection, I suggest almost any other breed. 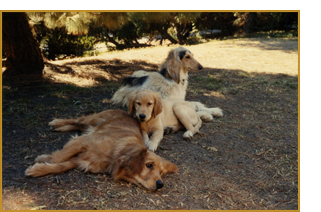 Because dogs are pack animals, the family group is perfect for them, one most of them love and can enhance. Most dogs love unconditionally, are enthusiastic and joyful, love to play, are loyal, can be made happy by the simplest of things, live in the moment, and prefer being close to nature – in their essence, they remind us about what’s important in life. These qualities of these very special beings are great gifts for a family. Charlie brought these gifts and more. Starting when he was very young and throughout his life, what he wanted most was to be with his family and in his house. That meant everything to him, far more than being out and about. Sometimes when Charlie and I would be out walking, he’d decide we’d gone far enough. So he’d sit down and not budge until I capitulated and said we were going home. He’d then stand, tail wagging energetically, and walk to his home. Charlie brought all this to our family, and to me. He was easy to be with, a Buddha, no matter what was going on. Problems for Charlie were like gnats going by. He’d get through them calmly and then bounce out of them with joy, at times doing much better than before the problem happened. He was like this for his entire life – every single year and every single minute. He was exemplary. Even just after a surgery or other serious health event, there he’d be, raring to go after having encountered what many dogs probably would not have pulled out of. Charlie taught us to forge ahead, no matter what. He was a master, indomitable. His whole life Charlie also had a wonderful sense of humor. When something he did made people laugh, I could see him actually be pleased with himself. One of his nicknames, given to him by our housekeeper, was “Funny Charlie.” To this day, when I think of Charlie, I smile. Let me tell you about a few of his funny ways. Charlie threw his paw high in the air when he wanted something, usually to be petted. For such a large dog, that was the cutest behavior. And if I sat on the floor cross-legged, Charlie (all one hundred pounds of him) would back up like a truck, plop himself backwards into my lap, and then turn his head and, with a big smile, look at me. Of course I’d be laughing as he did this. And then sometimes I’d lie on the floor with my knees raised, to rest my back, and as soon as Charlie saw me doing that, he’d come over and lie across me, actually pinning me down, again with that great big grin on his face. I’d be laughing hysterically and usually would need help to get him off of me. He was so proud of that behavior. Of course, because Charlie saw me laughing so hard at things he’d do, that would encourage him to keep on doing them. Even when Charlie didn’t feel well, it was sometimes difficult to know that, because his sense of humor seemed to override everything. Charlie was an old soul, yet one who acted like a puppy all his life. He was generous of himself, giving so much to me and to our whole family. His character made him a central grounding figure in our family. Even now, I still ask myself, “What would Charlie do?” And I think Charlie’s beautiful, wise, and very solid character contributed to his long life. Charlie served as an example of how to live. He was an extraordinary being. Who lived an extraordinary life. And ours was an extraordinary relationship I feel blessed to have shared with him. All my dogs have given me the feeling of being a part of a wonderful family, Charlie maybe more than most. But then again, dogs are family for me. And happy reading to all! Barbara Lampert is the author of "Charlie: A Love Story" and a psychotherapist specializing in relationships. She lives in Malibu, California. Her passion is dogs. Mad About Pets' review of "Charlie: A Love Story" can be found here. A few days after we noticed Gabe’s changing behavior, Gabe didn’t eat his canned food at dinnertime. Gabe ALWAYS eats his canned food; in fact, he begs for it and scarfs it down like he’s starving. I thought perhaps he was just being fickle and no longer liked that particular flavor of food. My husband and I passed it off, and didn’t think much more of it until that evening when there was a trail of blood outside of the litter box. I had already gone to bed when my husband noticed the blood. It was just a few mucousy drops, but it was still very alarming. My husband woke me up and told me about the blood, and I immediately noticed Gabe wasn’t laying at the foot of the bed in his usual location. “Where’s Gabe?”, I asked in a panic. I searched the bedroom for Gabe, and my husband searched the basement. We called out his name to no avail. A few moments later I heard my husband’s voice yelling, “Please come down here!” In the basement I found my husband standing over poor Gabe, who was crouched under the stairwell looking positively awful. His coat looked lackluster and dull, his eyes were wide and frightened, and he was clearly attempting to hide. I reached down to pet Gabe, and he let out a pitiful meow. Something was clearly very wrong. When we got to the vet clinic, a nice nurse took us into an exam room and weighed Gabe. He was down to 8 pounds, and was very dehydrated. Gabe’s temperature was also unusually low. The vet did an examination, checking for any evidence of urinary discomfort (due to Gabe’s history of struvite crystals). Though Gabe was clearly not well, the physical exam did not show anything unusual other than some slight hardening of the intestines. The vet’s diagnosis? Gabe was suffering a flare-up of IBD. The vet gave us a few options of how we could treat the issue at hand, and we decided to treat the immediate flare-up with some painkillers, subcutaneous fluids, a bland diet, and some probiotics. The vet informed us that IBD is something Gabe will always live with, and there are numerous ways to diagnose the root cause. A full blood panel could be done, an intestinal biopsy could be taken, etc. My husband and I both decided that at 12+ years of age, we have no desire to put Gabe through a barrage of invasive tests just to prove what we already know. I decided to go back to the drawing board, and do some research. After hours of researching IBD, I came to realize that Gabe’s issues were probably caused by his diet. I had been feeding the cats canned food for dinner every evening, but it was always flavored with some sort of fish. As it seems, many cats cannot tolerate fish and in fact are allergic to it. I had no idea! 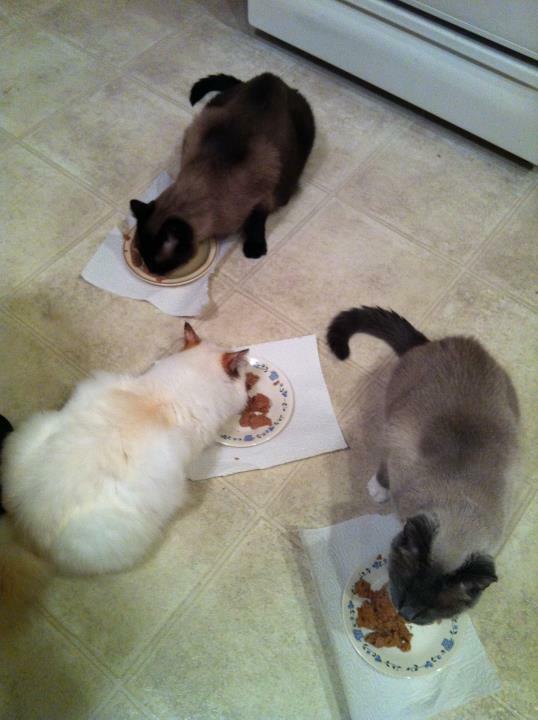 My cats were also on a primarily dry food diet. 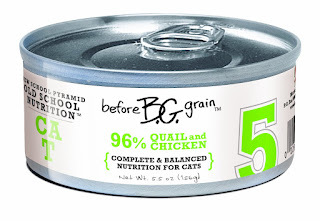 Though the food I was buying was high-quality, I learned that dry food diets are in no way ideal for cats. In fact, most cats on dry food diets go through their lives partially dehydrated. Dry food diets can be linked to diabetes, obesity, renal failure, and IBD. I decided to go for the gusto and switch the cats over to a canned diet only. I scoured the canned food aisle at my local Mounds Pet Food Warehouse to find canned foods without fish, without grains, and with as little vegetable content as possible. I bought a smorgasbord of different varieties to find out which would most tempt the cats. I knew the cats were not going to be happy about having their kibble buffet taken away, but after all I’d read I knew it was what I had to do. Let me tell you…the transformation has been amazing. After cutting out the kibble and switching to canned, the health of the cats has visibly improved. Gabe’s IBD symptoms disappeared, and his chronic yeast infection in his ears has subsided. Our Birman’s tear staining stopped, and her intermittent diarrhea has not returned. All three cats are more active than they’ve been in years. I could hardly believe the difference the diet change made! I’m now experimenting with a raw diet for the cats, so we’ll see how that goes. I’ll keep you updated on the diet changes! The moral of the story? Ditch the kibble! Gabe says so! It's a fact: most kids love animals, and most kids love helping animals. Why not foster that love for animals early by helping your child support their local animal shelter? Here are three fun and creative ways your child can help animals in need. Most kids already have way too much stuff. The last thing they need is another action figure or doll! Use your child's birthday party as an opportunity to teach him/her "it is better to give than receive" by asking party attendees to provide gifts for the shelter animals rather than gifts for the birthday boy/girl. Contact your local animal shelter to see which supplies are most needed (towels, detergent, food, toys, etc. ), and provide a list of those items on the birthday invitation. Some bigger shelters even have a party room to hold birthday events! Your child will be very proud when they deliver all the animal gifts to the shelter, and may even get a feature on the shelter's website thanking them. Somehow kids manage to amass a small army of stuffed animals at an alarming rate. Encourage your child to pick out a few meaningful favorites, and donate the rest to the dogs at your local shelter. Many dogs enjoy carrying around stuffed toys, and even cuddle with them in their pen at the shelter! Make sure you contact your local shelter to ensure they accept this sort of donation before you go herding up bags of plushies, though. It's also best to wash stuffed animals with an unscented detergent and thoroughly dry them before offering them up for donation. Kids might be sad to see some of their stuffed toys go, but they'll be glad to know their old teddy might be keeping a lonely shelter pup company. Teaching your kids to support shelter animals at an early age will help them learn more about pet adoption and the importance of practicing kindness to those (both human and animal) in need. Lorraine Coyle is the artist behind Evergreen Crystal. 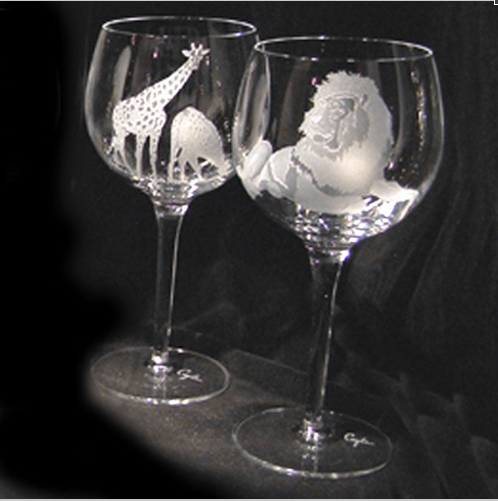 She brings her love for wildlife to vivid, sparkling life in her work on crystal and glass. Her etched glasswork is the perfect display item or functional piece for use in a home-bar; from shot glasses to wine decanters, Evergreen Crystal is gorgeous glasswork. Robert Hall Parry (of Robert Hall Originals) uses the unique medium of pewter for his art. In fact, he is a Master Pewtersmith (one of the few in his native Canada). 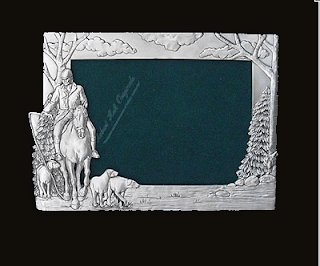 Robert has a variety of décor items available from picture frames to wall hangings, all gracefully presented with the soft yet detailed look of pewter. Every piece is hand-cleaned and hand-buffed to further accentuate the beauty of the pewter. If you’re into bright colors, Kingspoint Design and their vividly enameled figurine boxes will be right up your alley! Each figurine box is not only a gorgeous sculpture, but a functional box for storage of small items like jewelry. 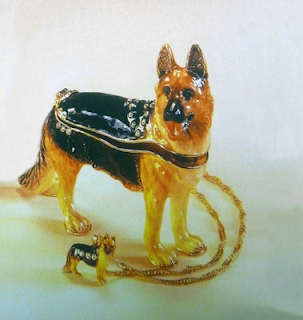 For dog lovers, many different breeds of dogs are available in Kingspoint’s collections. However, many species of wildlife are also represented including horses, polar bears, and other Arctic wildlife. 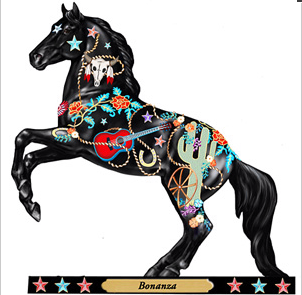 To add even extra bling to the pearlized enamel, every figurine box is accented with Swarovski Crystals. Kingspoint Design also offers matching jewelry sets. Okay, okay…so Bow River’s gifts don’t quite count as “home décor”. I can’t help it, I still had to share! Bow River creates adorable custom jewelry sure to delight any horse fanatic. 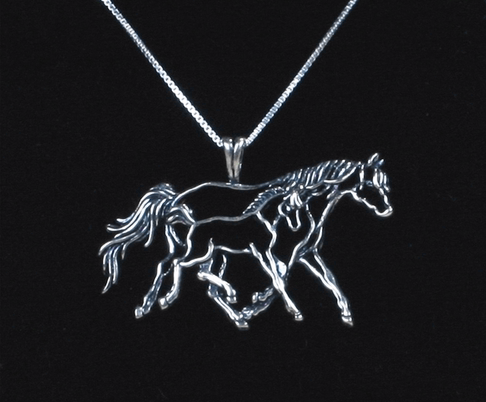 Bow River uses talented carvers to create intricate, delicate charms like horseshoes and horse silhouettes in gold, white gold, and sterling silver. In addition to necklaces, Bow River offers rings, earrings, and other jewelry accented with sparkling diamonds. Much like Kingspoint Design, Trail of Painted Ponies is all about bold, bright colors. 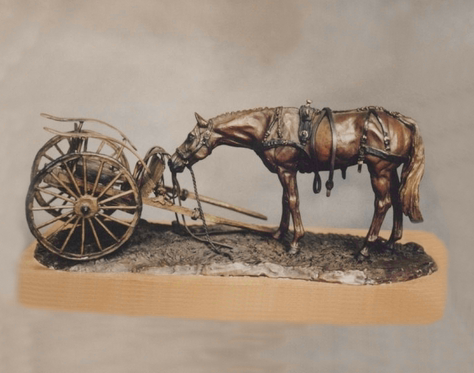 As the name would indicate, Trail of Painted Ponies specializes in three-dimensional horse statuettes and ornaments. Far from the realism portrayed by some other makers, these statues and ornaments are often whimsically decorated with swirling, lively, fun designs. For horse fanatics, it will be hard to pick which one is your favorite! 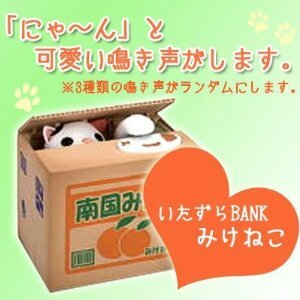 $15.00- Cute coin bank, place coin on "fish" and watch the mechanical arm grab the coin. 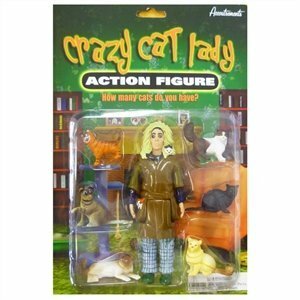 $9.00- Crazy Cat Lady Action Figure includes: Every town has a Crazy Cat Lady. She is the one who lives in a tiny house full of feral felines. This 5-1/4in. 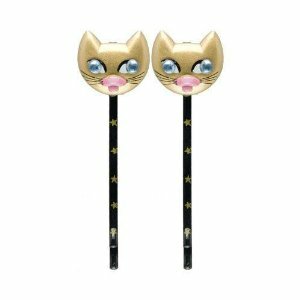 (13.3 cm) tall, hard vinyl Crazy Cat Lady Action Figure has a wild look in her eye and comes with six cats. 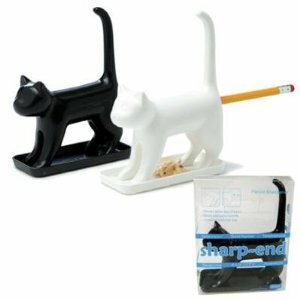 $10.00- Just watch your cat lovers connect with this charming, magnetic mini kit! Five popular breeds immortalized on die-cut magnets with a bonus hairball piece, too! 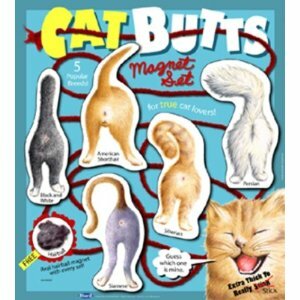 The Educational North American Cat Butts Field Guide rounds out this epic gift opportunity from the Blue Q gang. 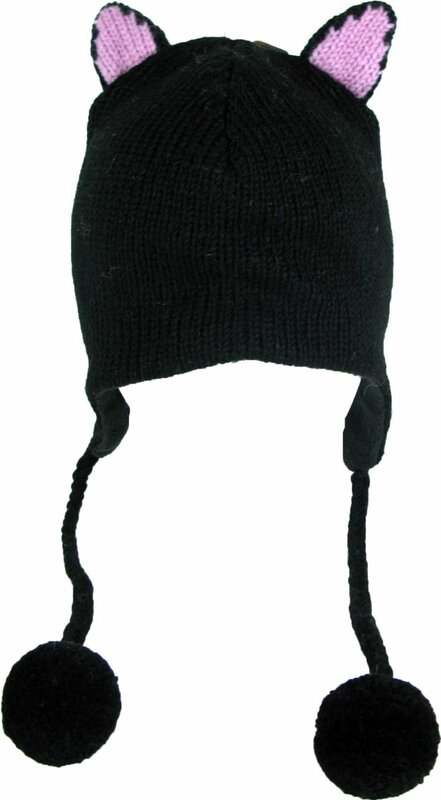 Fleece lined interior of hat. $29.00- These Laurel Burch totes are designed with her magically uplifting whimsical creatures. The bright colors, fun images and the practical construction of these totes make them popular all over the world. Features-10 by 15-1/2 by 4-inch, cotton shoulder straps, main zipper closure, a 6 by 6-1/2-inch zippered pocket with a removable bottom support. 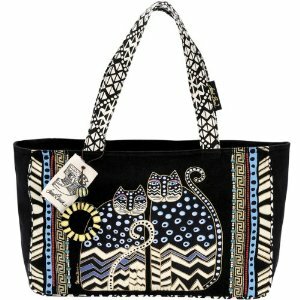 Spotted Cats is constructed of heavy canvas with bead accents and includes one canvas and one wooden charm. Imported. $45.00- With its chunky sole and unique design, the A8037L is enough to make you purr with content. 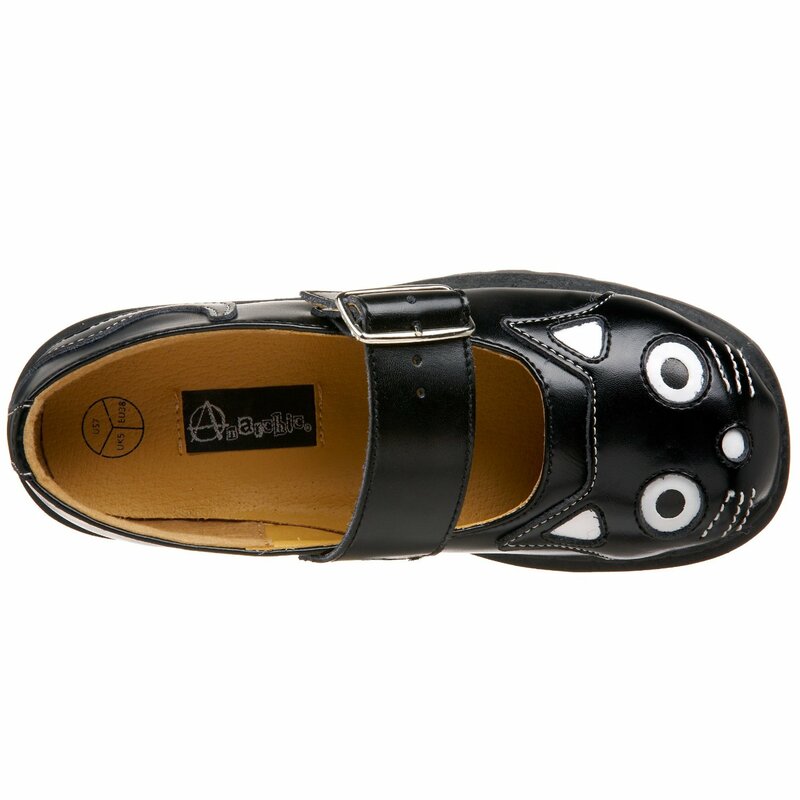 With every step, you're walking with your best paw forward thanks to an adorable cat design at the toe, but that's just the tip of the tail. Continuing on the feline theme is a stitched-on tail, wiggling its way up the counter. There's no doubt about it. 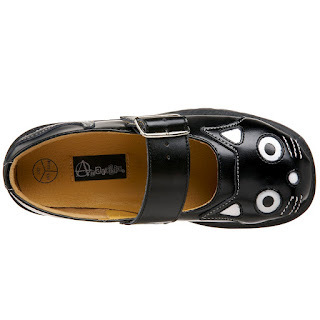 This shoe is the cat's meow. 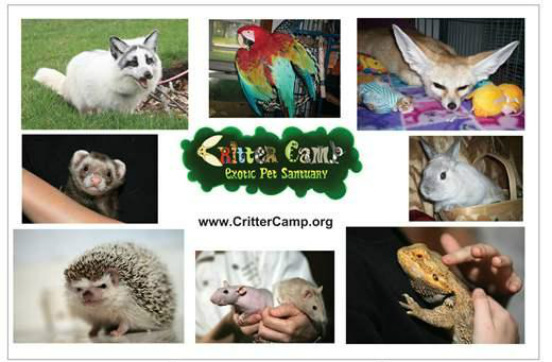 Critter Camp is an exotic animal rescue in northern Illinois that gives abused, abandoned and neglected exotic animals a place to call home. 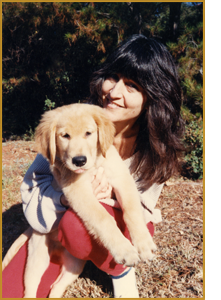 Owner and operator Beth Randall pours her heart and soul into this rescue, as you can see by the interview Mad About Pets did with her a while back. It takes just 2 seconds to vote, and could make all the difference for this great rescue! If you can share the voting link and get just one other person to vote, you will also get a bonus vote. If you're a Chase cardholder--even better! You get 2 extra votes! Thank you for your help from Mad About Pets, Beth Randall, and the hundreds of exotic pets saved by Critter Camp every year! Owning a horse can be an incredibly rewarding and fun experience, but it comes with responsibility. A lot of care needs to be taken when choosing a horse, especially when it is the first time one is being bought. It is easy to get excited and carried away by color, size or temperament of a horse and regret their decisions later. Take time, look around at all the possibilities. 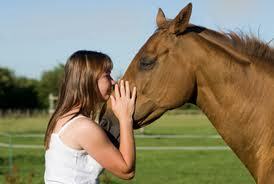 Spend time with him/her and get to know the personality of the horse. Once you break in and start a relationship, the whole impression of a horse change, and often it is clear which one is the right choice. Spending time with the horse is the best way to cultivate trust and develop a bond. It is best to not rush this important phase of building a relationship, as it is fundamental to the future happiness and fun that can be received from the horse as well as given. To start with, provide consistency and routine with food, water, shelter and grooming. 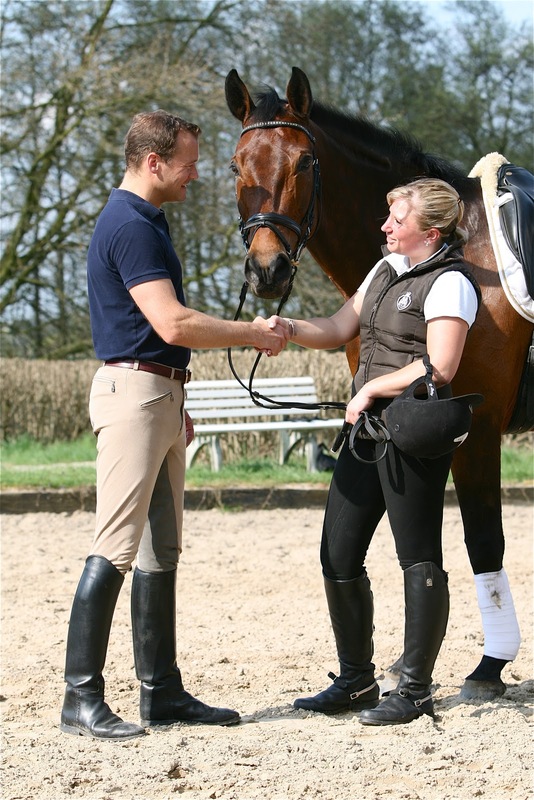 Grooming is a great time to bond, as it can feel as good for the horse as it is pleasurable for the owner. When grooming, be sure to start with techniques that the horse already knows and add, or change, things slowly as the relationship and confidence increases. The most important thing around a horse is calmness and rhythm. Whether walking, talking, brushing, saddling the horse or swinging a rope, it should always be done with a calm and steady rhythm. Horses will perceive any excitement, or surprises, as a threat. Horses need space and light in their stables, as they are not happy spending too much time in the dark. It is vital that the stable is kept clean, in order to prevent mildew and bacteria and not let it become a heaven for parasites. All of which could lead to serious illness and infection for the horse. If a horse is not comfortable and happy in its stable, then it will never settle down and get the rest it needs. This means a grumpy horse that will not heed to any training, and a lot of frustration for the owner. If horse and owner are unhappy, it is a recipe for disappointment and a long struggle, so it is essential that the horse’s basic comforts and needs are met. Horses are essentially grazing animals, so the bulk of their food should be hay and forage. As long as it is good quality, it is enough to maintain their nutritional needs, and supplements may only need to be given occasionally. A horse eats about two to four per cent of its body weight every day. This can increase in winter. It is also vital that the horse has access to clean water at a comfortable temperature at all times. A healthy mature horse can drink up to 12 gallons a day. Adequate water intake is necessary for their digestive system. 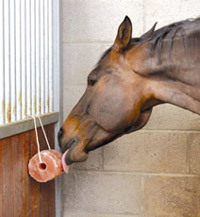 A horse also needs salt in its diet; either by having a salt block to lick on, or fed loose white salt. This is just as important in hot climates as it is during winter. Hayley works at Anything Equine, In her spare time she writes helpful advice and tips for beginner riders on a range of topics including equestrian health conditions and pasture management. If you’ve visited any pet stores lately, you’re probably aware that pet toys are expensive—not just expensive, but ridiculously simple to replicate at way less than $10 a pop. If your dog is anything like mine, she has little regard for how pricey a new toy was for you—she just knows she wants to destroy it in the shortest amount of time possible. (I have one particularly sour memory of a really cute, really expensive stuffed hedgehog toy that was annihilated in a matter of hours.) So why not make the toys yourself? You’ll be less grumpy when your furry friend has gone through them, and you’ll save a ton of money. You probably already have most of these things around the house—more money saved. Kongs are one of my dog’s favorite toys—they’re great to chew on, and it’s a challenge for her to get her snacks out of them. I like them because they’re reusable—but I also like a version I can make myself. Put a couple of small snacks in a sturdy sock and ball the sock up. Put the first sock inside of another sock and tie a knot in the outer sock. This toy will keep your dog occupied for a good amount of time—you can relax for an hour or two. 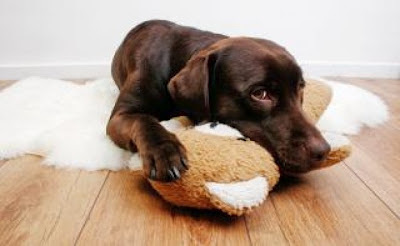 If your kids (or, hey, you) have any stuffed animals that don’t get much use or love anymore, those toys are sure to get tons of love and attention from your dog. Just cut a slit in the stuffed animal, remove the stuffing (because it can be dangerous if your dog ingests it), and sew it back up. My dog has a hollow moose toy that she alternately nurtures like a puppy and violently flings around by its neck—and it’s been around for a couple of years. Brandy Martin writes about pet health and care, and works with two animal clinics in Oklahoma City. 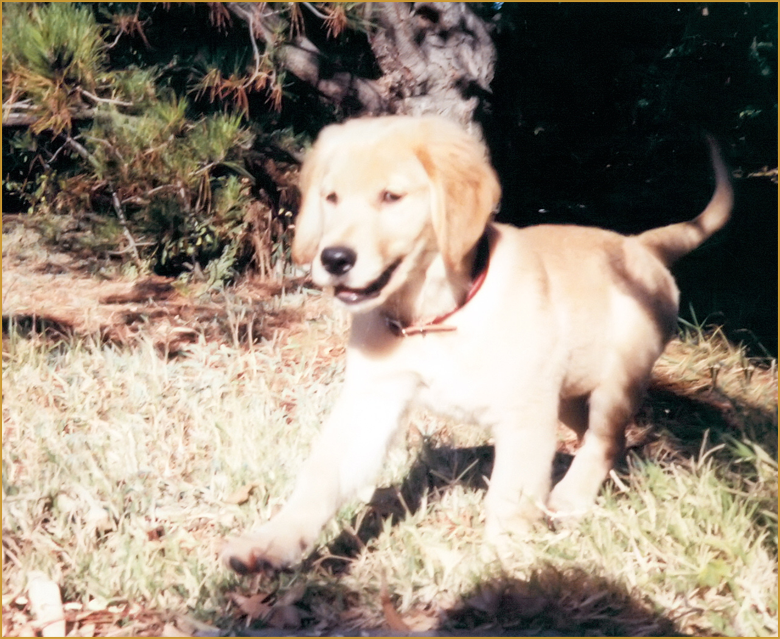 For dog grooming Oklahoma City offers specialist at Pet-Vet Supply and visit PMC of Edmond for dog boarding in Edmond OK.
“Charlie: A Love Story”, by Barbara Lampert, is the story of love, illness, and loss between the author and her beloved Golden Retriever, Charlie. Barbara is an avid gardener and was journaling the progress of her huge garden and landscaped yard, but as Charlie began getting sick with a myriad of illnesses, the journal became as much about his struggles as it did about gardening. For anyone who has ever lost a pet or struggled with a pet’s lengthy illness, Charlie’s story is a tough one. 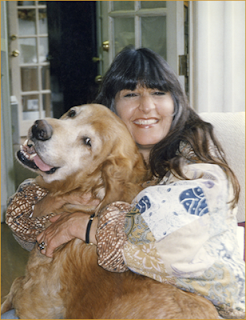 Having dealt with a pet with an extended illness myself, I sympathized with the emotions Barbara was going through in an all-too-real way. The constant ups and downs, worrying if you’re making the right decisions, hoping for more time with your beloved pet but realizing nothing lasts forever…the feelings are raw, deep, and unforgettable. “Charlie: A Love Story” is a perfect portrait of the emotional depth of love we can feel for our pets, and a testament to the lengths we will go to ensure our pets can stay with us just a few, precious moments longer. It proves how those of us who love animals can have multiple pets and love them all equally, but still have a particularly special bond form with one pet that sets them apart from the others. It is also a testament to the strong, positive spirit that animals can possess even when their pain and sickness becomes too much for their humans to emotionally bear. If there is one criticism of “Charlie: A Love Story”, it is that perhaps the journal entries heavy on gardening talk may not be universally interesting to all readers. There is much discussion of different sorts of plants, and readers unfamiliar with them (or with no interest in gardening) may find themselves skimming through the descriptions. Those interested in Charlie's story alone (and not the garden journal backstory) may find their interest wandering during these passages. However, even for those without interest in horticulture, the sheer joy and relaxation her yardwork brings to the author is palpable. I found myself picturing Barbara’s garden, and wishing I could sit on the soft grass with a loving Golden Retriever by my side. I understood the tranquility and bliss that Barbara must have felt. A word of warning: you WILL need tissues when you read this book. I found myself raising the book up to eye level so that my husband wouldn’t catch my eyes welling up with tears every few chapters. It was hard not to re-live the emotions I felt during my own pet’s extended illness, and I expect it would be hard for anyone who has lost a pet not to do the same. At the same time, it reminded me of the special bond I felt with my own pet and allowed me to experience that special love again. 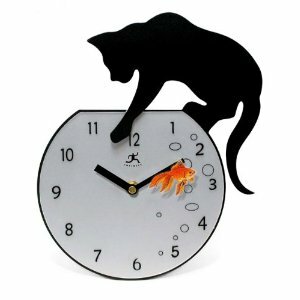 (Mad About Pets) How did the idea of Stand-Up for Cats come about? (Stephanie Sherlund) Cat Care Clinic is celebrating our 25th year of providing expert care for cats and the people that love them. With our anniversary, we wanted to do some outreach to the community. We have been helping other organizations with providing professional dental treatments to adoptable cats at Dane County Humane Society and also helping Friends of Ferals to adopt out kitties. I have been involved in the Madison Stand-Up Comedy scene for a couple years and thought it the perfect opportunity to put on a show the whole family can enjoy while raising funds to help all the kitties at Dane County Humane Society. What kind of comedy can people expect to see at this event? The event is for kids of all ages. While most comedy events tend to steer toward an adult audience, this event is going to be light-hearted, goofy and clean. We have also for our anniversary been working events at the DCHS such as Catapalooza and Kids Extravaganza! 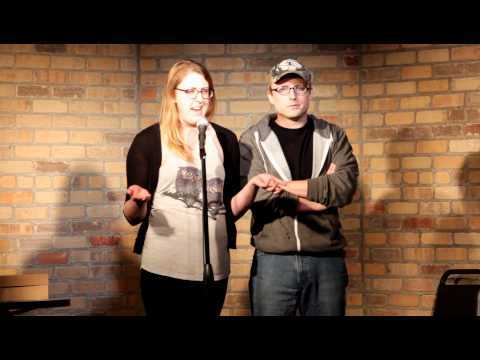 Can you tell us a little about the performers at Stand-Up for Cats? I hand selected each comedian performing at the event; we are all great friends and mesh really well as comedians and friends. I chose comedians I believe would work well for a family-friendly audience and of course my fellow feline lovers! Alan Talaga is a local talk-show host who holds The Dan Potacke Show monthly at The Frequency and is also a co-writer for Off the Square comic strip featured in The Isthmus. He jumped at the chance to be involved with anything cat-related. Ryan Casey originates from Richmond, Virginia but has been gracing the Madison comedy scene for the past couple of years and we’re glad to have him—he came in third at Madison’s Funniest Comic 2012! Adam Waldron is not only the artist who came up with our wonderful flier idea-- he is also a long-standing Midwest comedian with a child-like spirit that kids and adults alike can relate to. 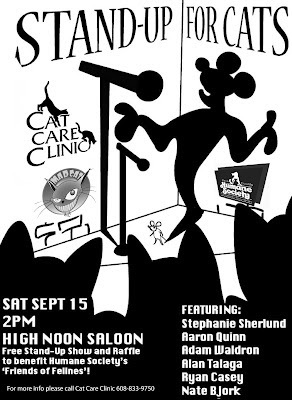 Aaron Quinn is a Madison Comedy native, though he hasn’t been on stage for a couple years; he is making his triumphant and much anticipated return to help us “Stand Up for Cats”. Nate Bjork, the event headliner, is not only a great comedian, but the proud father of two wonderful kitties—his humor is goofy and fun for the whole audience! Besides comedy, are there other activities at the fundraiser? We will be doing the stand-up event, of course, and between comedians we will be giving away our raffle prizes. Tickets for our raffle tickets will be $4 a piece or 3 for $10, 6 for $20. We have various prizes to be given away and the guests will get to decide what they opt in to win. Our prizes have been donated by local businesses and vary from hotel stays to Ale Asylum beer/t-shirt, Food Fight gift certificates, Avid Microchips for your kitty, Milio's gift certificates, gift baskets with many cat related prizes and many more great donations! Cat Care Clinic will be giving away TWO Adult Wellness Packages which include an exam, bloodwork, urinalysis and 6-month supply of Revolution parasite preventative! We will also donate a behavioral consultation with the founder of the Cat Care Clinic, world renowned feline behavior specialist, Dr. Ilona Rodan! In addition to our great prizes given between comics you can also get a drink at the bar at our venue, High Noon Saloon, which so graciously donated the space for our event and we will have some desserts out for our guests! 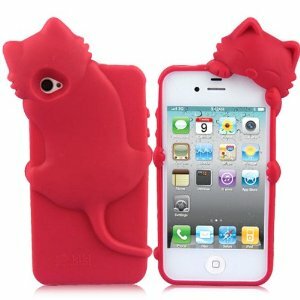 How will the proceeds from Stand-Up for Cats be used? Unlike a generic donation to the Dane County Humane Society, all of our proceeds go to benefit DCHS’s Feline Friends division. We have been fortunate to have every aspect of our event donated either by local businesses or Cat Care Clinic itself, meaning every single raffle ticket price will go to the kitties at the shelter. Feline Friends donations go to pay for all the food, litter, bedding, medical supplies, vaccinations, microchips, toys, etc. Animals, like humans, have rights. While the debate still rages on whether a pet is a person's property or a companion with feelings, many countries and states have enacted laws designed to protect animal rights. The effort to establish laws that will protect animals from abuse and ensure their proper treatment is ongoing and gaining ground. In the United States, the landmark law is the Animal Welfare Act of 1966 (AWA) that regulates the treatment of animals. It is enforced by the US Department of Agriculture (USDA) and its agency the Animal and Plant Health Inspection Service (APHIS). The law covers all warm-blooded animals used in laboratory tests, experiments, exhibits as well as those used or sold as pets. The AWA sets the standards for the humane handling of animals, their feeding, shelter and housing, protection, sanitation, and adequate veterinary care throughout the life of an animal. The law also addresses the psychological needs of an animal and requires, for instance, that dogs should be exercised. In 1990, the Food, Agriculture, Conservation and Trade Act was amended to include more specific provisions for the protection of pets. Among other rules, the law requires an animal dealer to hold on to an animal for a minimum of 5 days before selling it, so its original owner can recover the animal. The dealer must also give the recipient a certified record of the animal's history including transfers and modifications. Violations can reach up to $5,000 for every dog or cat sold. Repeated violations can cause the dealer to lose its license. In 2007, the Animal Fighting Prohibition Reinforcement Act made animal fighting a felony with up to 3 years' imprisonment for violators. Even trading in objects for animal fighting, such as gaffs, is considered a felony under the law. In 2008, more laws were enacted prohibiting the sale of dogs below 6 months of age and ensuring that they are healthy and properly vaccinated. Penalties for violations were also raised to $10,000 per day for every animal, and 5 years' imprisonment. Other nations have their own laws designed to protect animal rights. For example, India has the Prevention of Cruelty to Animals Act; Japan the Welfare and Management of Animals Act; Taiwan the Taiwanese Animal Protection Act; the UK Animal Welfare Act 2006. In the USA, many cities and states have enacted their own laws over and above the AWA provisions. Spearheading the effort to improve laws regarding animal rights is an organization called In Defense of Animals (IDA). Founded by Dr. Elliot Katz, a veterinarian, the organization aims to “end animal exploitation, cruelty and abuse.” The IDA seeks to raise the “status (of animals) beyond mere property, commodities or things” through “advocating for the rights, welfare, and habitats of animals.” Through the years, the organization has been successful in many projects to improve the welfare of animals. Fighting for rights, whether of human or non-human creatures, can be a long and difficult task. Animal lovers everywhere, however, are confident that the battle for animal rights will eventually be won.